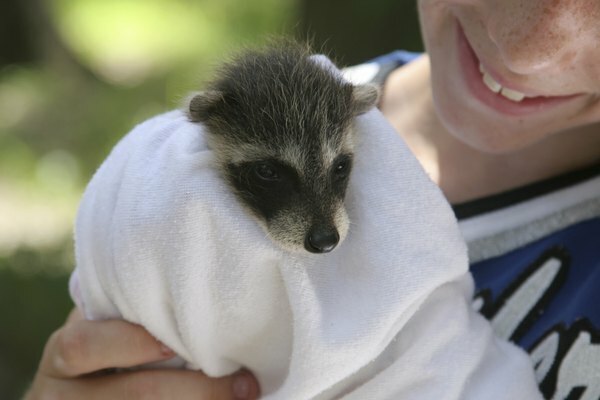 Raccoons are adorable animals, especially when they’re babies. The way they touch things with their sensitive paws, vocalize their needs with a series of sounds and follow the people they bond to can definitely tug at your heartstrings. They are also very intelligent and playful animals. However, while some people keep them as pets, an adult raccoon may not be the best choice. North America is home to seven species of raccoon and 25 subspecies. The North American raccoon, which is the species you're most likely to have as a pet, is one of the few that doesn’t typically live on a tropical island. Raccoons have distinctive bandit-like masks and striped tails with five to seven dark rings that make them look unlike any other animal native to North America. Adult raccoons have hefty bearlike bodies and weigh 10 to 30 pounds or more, with males on the higher end of the scale. Raccoons are classified as carnivores, and like all such animals, have five toes on each paw and large canine teeth. The raccoon's sense of touch is highly developed, and it can unlock doors and open trashcans quite easily, so expect a pet raccoon to get into mischief in your house. Their sense of hearing is keen and they are primarily nocturnal, with good visual acuity. Raccoons have excellent climbing skills, and can descend headfirst down a tree trunk – or your furniture or drapes – unlike most mammals. They are also good swimmers, but only go in deep water if they need to escape danger. Neither male nor female raccoons are normally aggressive, but they can become so if they feel threatened. Being carnivores, raccoons are primarily meat eaters, but they are actually omnivorous in practice. 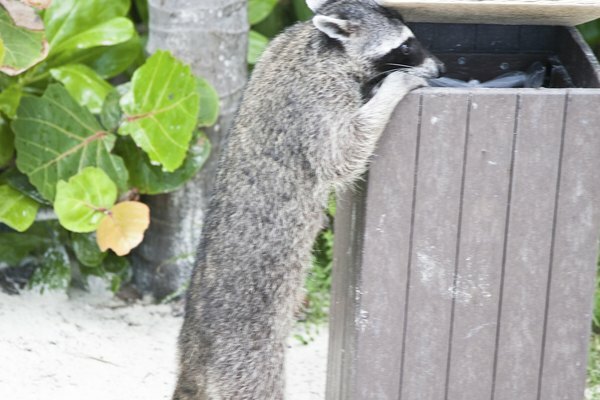 They eat many types of fruit, melons, berries, vegetables, corn, lettuce, eggs, grasses and bark – in fact, they will eat almost anything they can in the wild, although pet raccoons should be fed dry dog food as a staple and fruit and vegetables to supplement. 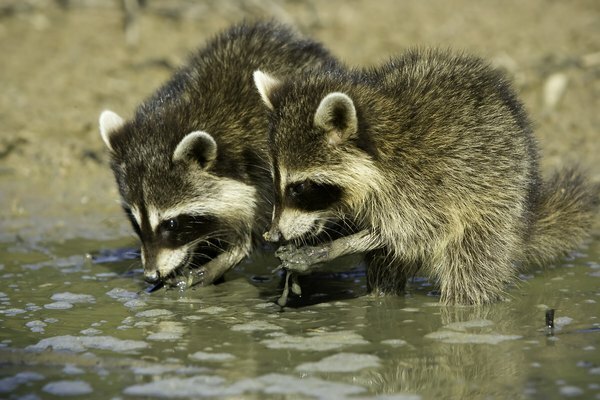 Yes, you should expect your raccoon to dunk his kibble and other food in the water bowl before eating it – the raccoon doesn’t exactly “wash” his food, as is commonly believed, but he does like to feel it, and the water play is reminiscent of how he catches acquatic prey in the wild. It might be difficult to find a doctor who can provide your raccoon with veterinary care, since this is such an unusual pet. However, it’s crucial to talk to a veterinarian about vaccinating your pet, because raccoons are prone to rabies and other diseases such as feline and canine distemper, tuberculosos, leptospirosis, salmonellosis, coccidiosis and toxoplasmosis. Common parasites include tapeworm, roundworm, heartworms and flukes. Sure, raccoons have been kept as pets – even President Calvin Coolidge and his wife, Grace, had a pet raccoon named Rebecca that they walked around the White House on a leash. However, while baby raccoons are some of the cutest animals you will ever encounter, raccoons are wild animals and grow up to act as nature intended. They are super curious, and often end up being destructive, even if it’s inadvertent. 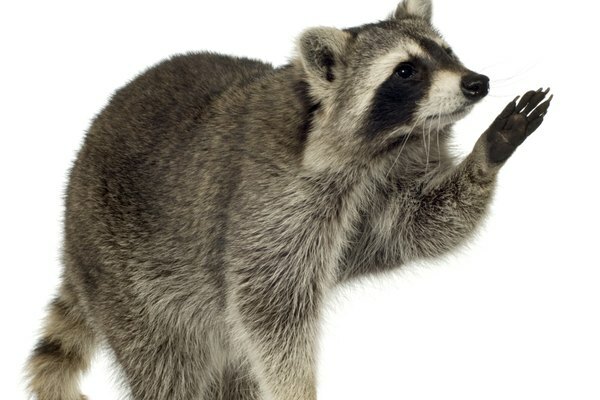 Owners of raccoon pets tell stories of scratches, bites, wrecked furniture and walls, clogged plumbing due to their raccoon putting “treasures” in the toilet, and more. So if you decide to have a raccoon as a pet, think hard about your decision. Also, it’s not legal to own a raccoon in every state, and many of those that allow it require a license or permit, so you need to check the laws where you live. 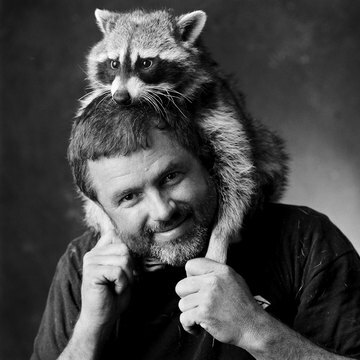 My Pet Raccoons: Is It Legal To Have A Raccoon As A Pet In My State? Dory and the Orphans: Should I get a Raccoon for a Pet?